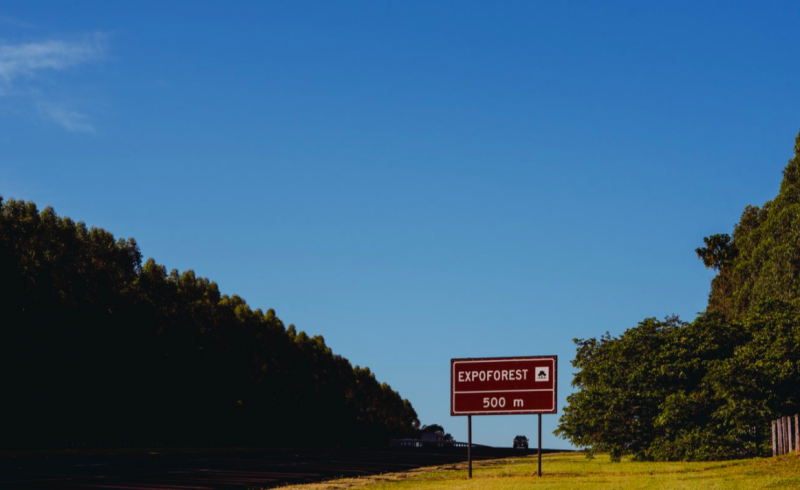 From April 11 to 13, the 4th Expoforest – Brazilian forestry Fair brought together 240 exhibitors and 30,000 visitors in one of the world’s largest and most dynamic forestry events of 2018. April 11th, 7:30 AM. The dust began to rise in the roads leading to the heart of a 200-hectare cloned eucalyptus forest belonging to International Paper. In their cars, pickup trucks, buses and vans, the foresters were coming. They were professors, students and researchers from the country’s greatest research institutions. They were professionals, managers, directors and administrators of the biggest forestry companies and machinery manufacturers from Brazil and all around the world. Under the hot morning sun and the shadow of the eucalypts, the visitors were faced, right at the parking lot, with hulking John Deere, Komatsu Forest, Tigercat and Ponsse machines. From the entrance, they were granted a glimpse of the Extreme motto that is the soul of the event – and of the forestry sector itself. Looking at the entrance to the fair, they saw the enormous “gates” made of piled logs. In the area beyond the gates, 240 exhibitors awaited them in their stands to present the most advanced technologies for timber production from planted forests. While they waited for the fair’s opening, the visitors took photos among the giant machines, tires and attachment heads in exhibition. A sound shook the air: a yellow airplane, glistening in the morning sun, flew over the forest applying herbicides, the first of the dozens of dynamic demonstrations held at the fair. The opening ceremony began at 8:45 AM, celebrating the strength and union of the Brazilian forestry sector. Finally, after the fair’s inaugural seedling was planted in front of the International Paper stand, the gates were opened and the massive influx of visitors began. It wouldn’t stop until the event was over, three days later. The time had come to experience the Extreme spirit of the 4th Expoforest, the Brazilian Forestry Fair. The gates of the Brazilian Forestry Fair were opened shortly after the event’s opening ceremony, which discussed the importance, growth and potential of the Brazilian forestry sector. “The forestry sector needs a place where the most modern technologies, assets and knowledge they produce can be demonstrated and discussed. The new forests of the future must certainly be implemented with cutting-edge technology – and many of the techniques that will be employed are being presented at this fair,” said Jorge R. Malinovski, president director of Malinovski, the Expoforest organizers. Other participants of the opening ceremony were João Salomão, the Agriculture and Livestock Ministry’s Coordinator of Forests and Livestock Matters; Adolfo Benedetti Neto, advisor to the São Paulo Secretariat for Agriculture and Supplies, representing Rubens Naman Rizek Jr, Acting Secretary for Agriculture and Supplies; Edson Tadeu Iede, Director of Embrapa Florestas; Edmilson Rodrigues, the Ribeirão Preto Secretary for Economic Development, Science, Technology, Tourism and Services, representing mayor Duarte Nogueira; Rodrigo Davoli, president of International Paper Latin America (IP Latam); Leandro Luciano dos Santos, mayor of Santa Rita do Passa Quatro; and Maurício Brusadin, São Paulo’s State Secretary for the Environment. If the 2018 Brazilian Forestry Week’s technical events outlined the main emerging technologies and trends for the future of silviculture, timber harvesting and transportation in the cultivated forests sector, Expoforest was the place where this future could be witnessed firsthand. 2018’s 240 exhibitors encompassed all the main areas of forestry production, such as silviculture, assets, harvesting, transportation, technology, biomass and timber processing, bringing their products, services and solutions to the visitors in static and dynamic demonstrations. During the fair, visitors could see the main innovations in the exhibitors’ respective fields, which are immensely varied and include: fertilizers; forest insurance; cranes; timber trucks; saws; herbicides and fungicides; drones and UAVs; forestry tires; management software; heads and attachments; off-road vehicles; formicides; hydraulic systems; PPEs; solutions in forest firefighting and fire prevention; technologies for forestry nurseries and seed production; purpose-built machinery for mechanized silviculture; telemetry systems; grinders, chippers and other forest biomass technologies – and much, much more. Based on the product launches and innovations presented at the fair (and the knowledge discussed at the technical events), it’s possible to provide a glimpse of what the forests of the future will be like: advanced genetic enhancements in species beyond eucalyptus and pine, including “noble timber” species; mechanized silviculture, from land clearing to tree planting, with planning integrated to the harvesting operations; fully georeferenced stands, mapped with LiDAR and UAVs carrying multispectral cameras and advanced software; automated timber harvesting; use of Artificial Intelligence, Internet of Things, machine learning algorithms, Big Data and Analytics tools, with smart and integrated management platforms; ensured, certified and monitored forests, with great gains in productivity, sustainability (environmental, social and economic) and security. Over the next pages, you’ll find an overview of the main innovations presented at Expoforest 2018 in several different links in the forestry production chain – from mechanized silviculture to new molecules for weed and pest control. At every major global forestry fair, the launch and presentation of new purpose-built machinery, attachments and equipment is always one of the highlights for visitors, especially for representatives of the largest forestry companies. Ever more productive, safe, economic, stable, connected and smart machines, with the use of onboard technologies and machine learning algorithms, as well as new simulators for operator training with VR technologies – those seem to be the tendency for the future of the great manufacturers. And these companies just won’t stop innovating: Finnish multinational Ponsse, which launched the H77 head at Expoforest 2014, now brought the worldwide launch of its newest forwarder boom, K121, specifically designed to answer the market’s demands, especially in South America. It has 22% greater lift capacity and 45% greater swing torque compared to previous versions, as well as a 16% larger grapple, reaching greater productivity and power. Ponsse brought 18 machines to the fair (in partnership with Timber Forest) and hosted three live demonstrations a day. Aside from the K121, the company also presented the Ponsse Manager platform, as well as new excavator harvester simulators with VR tools and structural changes in other machinery for greater fuel efficiency. John Deere’s hottest new product at Expoforest 2018 was the 2144G forest machine, the first machine built by Deere outside its traditional factories and the first manufactured in Brazil. The 2144G was designed and built for the Brazilian market to operate as a log loader, harvester, processor or grapple saw – a multifunctional, versatile and robust machine, with the highest swing strength of its class. The American multinational presented the four versions of the machine in their stand, as well as its full line of forestry solutions. In their stand in the fair’s dynamic trail, Komatsu Forest carried out live demos of machinery such as the 931XC 8-wheel harvester, which offers great comfort for the operator, low soil compaction rates, excellent manoeuvrability and stability for steep slope logging. Overcoming steep slope challenges is Komatsu’s goal, and the company offers several solutions such as the forestry winches presented at the fair. Another recent development was the acquisition of Swedish company Oryx Simulators, with the goal of broadening the Komatsu Forest portfolio. Represented by the authorized Brazilian resellers (PESA and Sotreq), CAT brought its full line of forestry machines to Expoforest. Moreover, the company also brought its SEM line of products, such as the SEM618D and SEM638D, launched in Brazil this year, as well as news for silviculture. In partnership with Tracbel, their representative in Brazil, Tigercat brought machines such as the 1185 8-wheel harvester, the largest such machine in the world, capable of carrying a 2.5 ton harvesting head, giving the equipment a longer lifespan. Another innovation is the new PenzSaur forwarder, fully designed and manufactured in Brazil. The new machine (6-wheel traction, 14 tons) was specifically conceived for the reality of the Brazilian market. As the 4th Brazilian Silviculture Meeting established, the mechanization of silviculture operations is a clear trend for the future. With the goal of reaching the same high technology standards already established in timber harvesting and transportation, machine and equipment manufacturers are working to overcome one of the market’s main current challenges: a lack of purpose-built machinery for mechanized silviculture, supplied today by adapting agriculture machines. Land clearing, soil preparation and mechanized planting are some of the capabilities of the new machines. “We see the mechanization of silviculture as a great future in Brazil and we’re really excited about that. We’re working on developing new models and machines for these activities, such as our 480B with our Tigercat mulching head,” said Grant Somerville, president of Tigercat industries. In Roman do Brasil’s stand, visitors were able to see the J. Hartwich solutions for mechanized silviculture: combined application sprayer in rows and between rows; mechanized granular ant killer applicator; cover crop fertilizer application; harvest slash clearing machine; forest irrigation equipment; and mechanized tree planting equipment with fertilizer application capabilities. CAT also presented innovations for mechanized silviculture, soil preparation and land leveling prior to harvesting. “We’ve brought our D8T track machine with forestry configurations, including V-shear and subsoiler, which can remove tree stumps in front while it prepares the terrain at the same time, with increased productivity,” said the CAT forestry products marketing consultant Marcelo Antunes. The Swedish manufacturer Bracke’s mechanized planting equipment was also a highlight of the Roman do Brasil stand. Savannah also presented their solutions for minimal planting with their line of Eco-Til ploughs and the Savannah Bioforce (subsoiler with V-shear). In soil preparation, Diamond Mowers, aiming to increase its presence in the Brazilian market, presented the Rotary Mower skid-steer, a frontal attachment fully capable of cutting trees up to 26 cm in diameter. And the technological innovations also extend to technologies for forest nurseries and seedling production. To eliminate reverse logistics in seedling trays, Correia Neto presented their innovative SIS BGC system, a new technology for seedling production which provides greater resource economy and production speed to forest nurseries, as well as automatic tray placing, germination and tree planting. The technological advancements are not restricted to purpose-built machines, nor harvesting and silviculture. The search for innovation is also the driving force for development in the timber transportation sector and in smart fleet management. Trends outlined by the major manufacturers present at the fair (MAN, Mercedes, Scania and Volvo) is the search for more sustainable fleets with lower fuel consumption due to structural innovations, as well as greater driver safety and comfort, more advanced onboard technology for integrated fleet management and telemetry for the operation parameters. Scania’s new solution for timber and pulp was the R 620 6×4 super truck, equipped with a V8 engine and recently launched by the company. A brand-new product, the truck was made as an answer to the forestry market’s demands for a new 11-axle set with a cargo capacity of up to 91 tons. Four other models were also in exhibition, made for different phases of the transportation operation – ranging from operations in the forest to the transportation of the final factory product. At Mercedes, the main highlight was the extra-heavy Axor 3344 8×4 off-road platform for timber transportation. The very first unit produced was taken for demonstrations at Expoforest. Together with Actros 2646 6×4 model, the trucks were available for test drives attached to semi-trailers for timber transportation. Power, robustness, resilience, low operational costs, availability for heavy work and high level of driver comfort are some of the characteristics of these models. At their stand, Volvo showed visitors its FMX, FH and VM models and their advanced solutions in transmission and motorization, with optimized power and torque for forestry applications. Equipped with the Volvo I-Shift Off Road gearbox, with factory options for 13 or 14 gears, the FMX model allows for a maximum traction capacity of up to 300 tons in specific applications. Other technologies showcased for this segment include structural innovations in tires, wheels, stanchions and cargo measuring tools, as well as Elithium’s remote fatigue sensor, a smart image monitoring solution and intuitive recognition software that detects and alerts driver sleepiness at the start and during transportation. A clear trend for the future of industry as a whole – and the forestry sector – is the exponential growth of smart technologies and the large-scale handling of variables (Big Data). The use of AI technologies, machine learning algorithms and Analytics tools will provide smart data management for cost reduction and increased forest productivity. Georeferencing is already an essential step towards the forests of the future. According to the products and services presented by companies such as 14pix, Spectrum, Horus Aeronaves and WW Aeroagrícola, the use of drones and UAVs in forestry will continue to develop, with technologies such as LiDAR and multispectral cameras. Aside from control from the skies, the forestry sector of the future will also have an eye in outer space. At Expoforest, Visiona Espacial presented highly advanced solutions such as multiplatform remote orbital sensing services with a virtual constellation of 29 orbital satellites (radar and optics) for Earth observation and forest monitoring, as well as an integrated orbital image base ranging from high to extremely high space resolution. Precise and integrated mapping of cultivated forests is essential for the development of smart management platforms capable of integrating all forestry operations. The management software companies themselves are also evolving rapidly, and some of the greatest players in this sector presented their solutions at the fair, ranging from high-precision silviculture to asset monitoring. Savcor Trimble, Inflor, Hexagon and Imagem (official ArcGis distributor in Brazil) were all present. The future also seems promising for forestry technology startups, such as Brazilian newcomer Treevia Forest Technologies and the Estonian company Timbeter. Treevia brought their SmartForest SaaS (software as a service) system, a platform for forest data management connected with IoT sensors, allowing for greater automated control of forest assets, as well as automated management, data gathering, processing and planning in forest inventories. The app developed by Timbeter for precise log measurement in piles has seen an exponential growth in downloads in the Brazilian market (620% from 2016 to 2017). Recently, Timbeter launched a new version of its mobile app, ideal for companies that need to measure logs in containers and pulp timber export companies. “We’ve had so many visitors we barely had time to eat. This is the most amazing fair we’ve ever been,” said founder and CEO Vallo Visnapuu. All these innovations presented thus far wouldn’t be possible if not for concrete advancements in the earliest stages of forest production – namely, genetic enhancement for cultivated forest species. This includes the development of new clones for already established species as well as the introduction of new species in the country, especially for “noble timber” (premium, high-quality wood) production. At Expoforest, ArborGen launched new eucalyptus clones in semi-operational stages as well as new Pinus taeda clones. Moreover, the company launched the “Maximum Productivity Challenge” project in partnership with Produquímica, representing the union between genetics and plant nutrition with the goal of increasing performance and continuously improving growth and yield in the forestry sector. In the dynamic area, Kolecti Recursos Florestais carried out live demonstrations of its services using specialized professionals and equipment for work in heights. The services include the collection and rescue of genetic materials, seed beneficiation, controlled pollination, vegetative reproduction and experiment implementation. In the noble timber sector, Bela Vista Florestal, a company specialized in Australian cedar production in Brazil, presented new clonal seedlings developed in-house and protected by the Ministry of Agriculture and Livestock. In order to ensure productivity, the forestry sector must fight the great threats to cultivated trees, especially biological pests (insects, fungi, nematodes, weeds etc.). Innovation in new molecules and solutions for threat control tend to prioritize more sustainable operations, with lower toxicity and biodegradable packages, as well as georeferenced capabilities designed to facilitate mechanized application. One of the new products was presented by Unibrás, the ATTA-FLEX Dorsal GPS, a tool for management of leafcutter ant control, with georeferencing tools capable of mapping the operator’s activities in the field and the doses applied, providing precise information on the place and time of formicide application. The Mebio (granular ant-killer in biodegradable micro-packaging) application technology was Dinagro’s launch at the fair. The protective casing for Dinagro-S granular baits has high oxygen permeability rates, providing great attractiveness to leafcutter ants and a low rate of permeability to water vapour. Atta Kill, a company belonging to the Agroceres Group, had two innovations to present: Mirex-S2, a new formula with 0.2% active ingredient concentration (33% lower than traditional sulfluramid baits) and the Result program, developed for the management of leafcutter ant control operations using modern operational technologies for maximum efficiency at lower costs per area controlled. Other threats were also contemplated by the exhibitors, such as the giant chemical multinationals, which carried out practical demonstrations of their products in the fair’s dynamic area. Syngenta presented their complete forest portfolio for eucalyptus from nursery to the field, with an emphasis on its Match EC insecticide for leaf-eating caterpillars. FMC presented their insecticide, herbicide and nematicide line for eucalyptus cultures, while Bayer focused on demonstrations of its Esplanade pre-emergent herbicide, already applied in over 70 thousand hectares of cultivated forests in Brazil. The “Bayer Forests: a free path to productivity” initiative took visitors for a walk through the demonstration space, providing a timeline for eucalyptus forest growth from seedling to 8-month tree, interacting with the Esplanade and Fordor 750 WG products. Dow Agroscience presented its wide range of forest herbicides, but the true highlight was the launch of its Míssil herbicide, a selective post-emergent graminicide for eucalyptus, pine and black wattle cultures. The development of post-emergent herbicides and the search for lower toxicity are trends for this sector. Other solutions presented by exhibitors include prevention and control of climate threats and forest fires. The technology companies AG Solve and Sigma Sensors brought their line of portable meteorological stations to Expoforest, easy-to-use solutions for the field, as well as software platforms for controlling and analysing the data gathered. On the other hand, Sintecsys presented their automatic forest fire detection system, taking visitors through a demonstration of their integrated platform for forest monitoring and team tracking in the field. These were only a few of the new innovations, solutions and products launched and presented at Expoforest 2018 – but much more was shown during the fair’s three days. Go to the list of exhibitors on the official Expoforest website to find out more about their line of work and solutions.